Smoking exposure is associated with pregnancy complications, as are levels of folate, vitamin B12, and homocysteine. 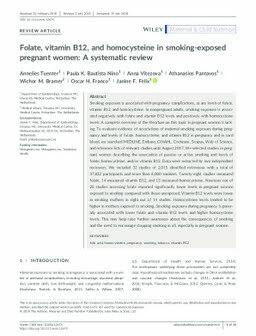 In nonpregnant adults, smoking exposure is associated negatively with folate and vitamin B12 levels and positively with homocysteine levels. A complete overview of the literature on this topic in pregnant women is lacking. To evaluate evidence of associations of maternal smoking exposure during pregnancy and levels of folate, homocysteine, and vitamin B12 in pregnancy and in cord blood, we searched MEDLINE, Embase, CINAHL, Cochrane, Scopus, Web of Science, and reference lists of relevant studies until August 2017. We selected studies in pregnant women describing the association of passive or active smoking and levels of folate, homocysteine, and/or vitamin B12. Data were extracted by two independent reviewers. We included 32 studies of 2,015 identified references with a total of 37,822 participants and more than 6,000 smokers. Twenty-eight studies measured folate, 14 measured vitamin B12, and 13 measured homocysteine. Nineteen out of 28 studies assessing folate reported significantly lower levels in pregnant women exposed to smoking compared with those unexposed. Vitamin B12 levels were lower in smoking mothers in eight out of 14 studies. Homocysteine levels tended to be higher in mothers exposed to smoking. Smoking exposure during pregnancy is generally associated with lower folate and vitamin B12 levels and higher homocysteine levels. This may help raise further awareness about the consequences of smoking and the need to encourage stopping smoking in all, especially in pregnant women.